'Seldomere', the Albert Fillmore Hyde estate designed by Ludlow & Valentine c. 1905 in Morristown, New Jersey. 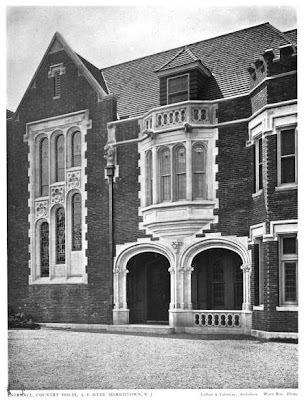 Hyde, a descendent of William Hyde who emigrated here in 1633, worked in the family business of A.G. Hyde & Sons, cotton converters and later founded the Hyde Real Estate Corporation which owned numerous buildings in New York City. He also served as the head of the Eastern Division of the Red Cross during World War I. 'Seldomere' was demolished sometime between 1963 and 1970. Click HERE to see 'Seldomere' intact in a 1957 aerial. 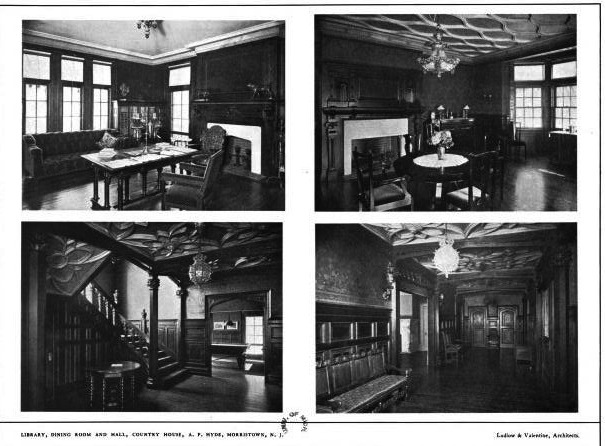 Photos from Architecture, 1906. 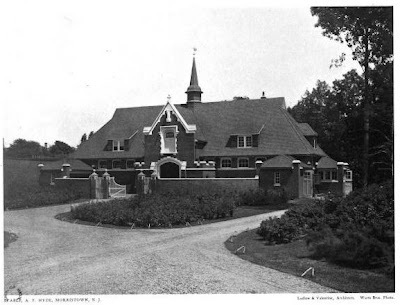 Seldomere was located on Old Glen Rd in Morristown. On Bing, there is a brick shell, half ruin, half house on the cul-de-sac of Easley terrace, the adjacent street tp Old Glen Rd. Looks like only the outer walls of the carriage house and the curving courtyard walls survived. Otherwise estate appears to have been over run by suburbia. Nice spot. Definitely part of the stable walls. 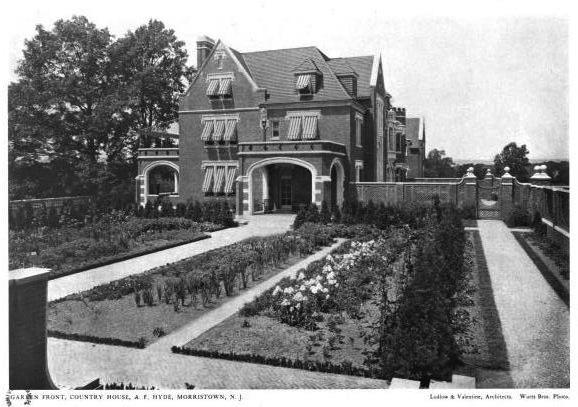 After the Central Railroad of New Jersey arrived in the middle of the 19th century, Morristown seems to have fallen into a competition with Plainfield to see which town would become the preferred NYC "millionaire's getaway." Plainfield seems to have won that up until about 1900, after which everything began to go south, as many of the children and grandchildren of the mid-century rich began to abandon New Jersey for the North Shore of Long Island. If anyone is able to find photos of the house mentioned above, the "brick shell, half ruin, half house on the cul-de-sac of Easley terrace, the adjacent street tp Old Glen Rd" found on http://binged.it/zSrmJq I would love to see pictures of it back in the day. I have looked so hard and have never been able to fimd its original photos. please help me out on this one. it would mean so much to me. 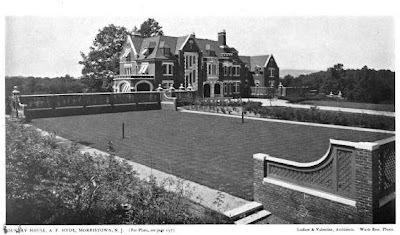 to June and anonymous (7/15)- my father was the resident caretaker for Sunnymeade, the abutting estate, from 1957-1971. Seldomere was owned at the time by a widower named Bradley. The main house still stood (empty) and he lived in the carriage house (stable). My father helped him and watched over the property for him. (Vandals were a problem.) Sometime during the early '60's Bradley committed suicide. (My father found the body). The property was then sold and developed as an upscale housing development called Bradwahl. Those houses still stand and sold for $40K and up. Pat A.